Gruyère (pronounced "groo-YAIR") is a smooth-melting type of Swiss cheese that's made from whole cow's milk and generally cured for six months or longer. Gruyère is a great table cheese, a term that refers to any cheese that can be eaten in slices, like on a sandwich or as part of a cheese platter. It also happens to be an excellent melting cheese, which is why Gruyère is one of the two main cheeses (Emmental is the other one) used in preparing the traditional fondue recipe. It's also (again, sometimes combined with Emmental, sometimes not) the cheese used to make the croque monsieur, that classic French grilled cheese sandwich that is a staple of Parisian bistros everywhere. Named for the town of Gruyères in Switzerland where it was originally made, Gruyère cheese is a firm cheese with a pale yellow color and a rich, creamy, slightly nutty taste. It features a few small holes, or "eyes", characteristic of Swiss cheese, which are formed by gas bubbles released by the bacteria that are used in making the cheese. 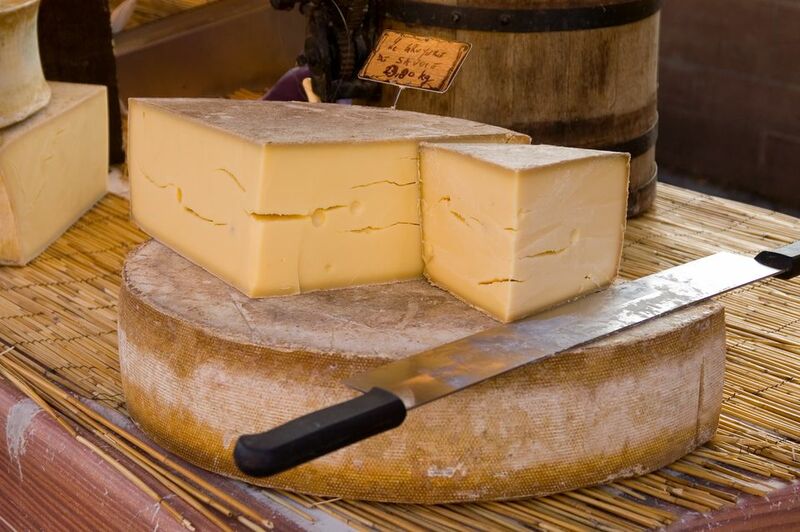 Gruyère has fewer eyes, and smaller ones, compared with other varieties of Swiss cheese. Not every cheese turns gooey when cooked, but Gruyère is an ideal cheese to use when the recipe's end result needs to be nice and creamy. And that's because of how it's made. Cheese starts off as milk which is then curdled, and then the curds are separated and squeezed, which forces out excess water. Cheeses that are curdled with a combination of enzymes called rennet will melt, while those that are curdled with acid (like ricotta or queso fresco) will not melt at all. And within that category, how well a given cheese will melt has to do with its water-to-fat ratio. In general, a cheese with a higher water content will melt well, whereas dry cheeses melt poorly, or simply separate into pools of fat. Furthermore, cheeses dry out the longer they are aged. Therefore, again all things being equal, a younger, fresher cheese will melt better than one that's been aged for any length of time. These days, Gruyère is widely available at most grocery stores, although it isn't necessarily the most affordable cheese. If your store features a cheese counter, the staff will probably cut you a specific size piece so you don't have to pay for Gruyère you don't need. Still, if you need a substitute for Gruyère cheese, you could try Emmental, Jarlsberg, Beaufort, comté or raclette, depending on the recipe. If you're looking to substitute a small amount of cheese, it may not matter quite as much. But if you need several cups of cheese (like if you are making fondue), an ordinary "American" Swiss cheese might be your best bet. If you're planning to use it in a recipe that calls for melting, make sure it's a high-moisture cheese. If you are new to Gruyère cheese, croque monsieur is the perfect recipe to introduce you to this flavorful cheese. To make an easy croque monsieur sandwich, start with two slices of bread, both sides spread with butter and Dijon mustard. Grate some Gruyère into a bowl, mix in enough béchamel sauce to moisten the cheese, and then spoon some of this cheese mixture onto one slice of bread; lay a slice of ham on the second slice. Bring the halves together and cook in a hot pan or griddle until the bread is golden brown, flipping midway through so it is cooked on both sides and the cheese is melted. In Paris, they serve the sandwich covered in more béchamel and you eat it with a knife and fork, but this version is much easier to handle.